Coach Ken Whisenhunt is grasping at straws to find any way to turn around a more than disappointing season. The Arizona Cardinals have now lost 7 games in a row, and are all but mathmatically out of the NFL playoff race for this year. The quarterback carousel continues, as John Skelton got into the mix during their last game against the St. Louis Rams on Sunday December 5th. The Cardinals first two posessions against the St. Louis Rams looked promising as both ended with field goals, and the Cardinals took an early 6-0 lead. Unfortunately, everything went down hill from that point. The Rams came back in their next two posessions to kick two field goals of their own and tie the score at 6-6. The next Cardinal posession of the game Derek Anderson threw an interception, which led to another Ram field goal. By halftime, the Rams already had the lead at 9-6. St. Louis scored the first points of the second half with a 27 yard touchdown run by Stephen Jackson. After two three-and-out series to start the second half by the Cardinals, quarterback Max Hall entered the game. On his first play he was sacked for a 7 yard loss. His second play was an incomplete pass, and on his third play, Max Hall threw an interception. By the end of the third quarter, the St. Louis Rams led the Cardinals 16-6. 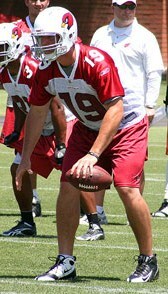 On the Cardinals fifth play of their first posession in the fourth quarter, Max Hall was sacked and injured on the play. Enter John Skelton, the Cardinals third string quarterback. He actually came in and threw two completions that took the Cardinals down to the Rams 29 yard line. The Cardinals incurred three penalties during the drive, including an intentional grounding, and the drive stalled at the Rams 44. The next posession John Skelton was sacked and the Cardinals again went three and out. The game ended with the Rams running the final 5:17 off the clock. I don’t know how things can get any worse for the Arizona Cardinals. At this point, it is difficult to know which is worse, the Cardinals Offense or their Defense. Taking a look at the quarterback stats below, you can see that the Cardinals have thrown 8 touchdowns and 16 interceptions so far this year. They have been sacked a combined 40 times, have a completion rate of 51%, and have thrown for a total of only 2,480 yards in twelve games (avg 207 yds per game). I guess I got the answer to my original question about how long it would be until John Skelton gets his turn to play. It took twelve games into the season before we all got to see the third string quarterback in a game. Perhaps Coach Whisenhunt got rid of Matt Leinart too soon, as he is now trying his second rookie at quarterback this year. Like I said before, it seems like Coach Whisenhunt has a quarterback carousel that just keeps spinning out of control. At this point in the season, he might as well throw John Skelton in as the starter to see what he can do. ~ by Troy Erickson Realtor on December 7, 2010.